Spain’s residential market continues to display good health with JLL forecasting 2017 to be the eighth consecutive year of foreign buyer growth. Overseas buyers lavished €888 million on Spanish properties in H1 2017, smashing last year’s record of €330 million for the same period with total investment for 2017 expected to exceed €1 billion according to JLL. In addition to foreign investment in property, the first half of 2017 has also been a record breaker for Spain’s tourism sector with the National Statistics Institute reporting that 36.3 million tourists visited between January and June, a whopping 12% rise compared to the same period in 2016. The majority of those who visited (8.6 million) came from the UK, while 5.5 million were from Germany; a 9.1% and 10% rise over the same period last year respectively. The National Statistics Institute has also highlighted an 8.5% increase in foreign tourists using non-market accommodation. The number of tourists visiting Spain using the housing of relatives, friends or their own is even higher than those using traditional market accommodation such as hotels or rental properties. In line with the observations made by JLL, Spain’s leading homebuilder Taylor Wimpey Espana, operational since 1958, is also seeing growth in international buyers. To date in 2017, Taylor Wimpey Espana homes across Spain have been purchased by more than 15 different nationalities with German, Scandinavian, British and Russian buyers the most active. To meet with such diverse international buyer demand, Taylor Wimpey Espana’s website is now available in eight different languages. The Balearic island of Mallorca is one Spanish destination attracting a great deal of interest both from tourists (a 20% increase in UK visitors was recorded in May this year compared to the same month in 2016) and foreign property buyers. 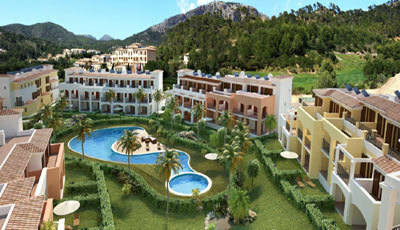 Taylor Wimpey Espana’s exclusive new development Camp de Mar Beach, perfectly located in the south-west of the isle, just 30 minutes from Palma international airport, is receiving particular interest. Enjoying direct beach access, this final phase of the hugely popular development consists of 3-bedroom Mediterranean style townhouses with underfloor heating, air-conditioning and solar paneled water heating as well as communal gardens and a large modern swimming pool. Camp de Mar Beach is located in the heart of the well-known Andratx golf course and is surrounded by beautifully manicured fairways and greens. Prices start from €650,000 + VAT. For more information, visit taylorwimpeyspain.com.